Mother's Day is Sunday May 12th! Get Started for only $95 - GAME ON! 60 minute Swing Evaluation providing a fact-based diagnosis of your golf swing. 60 minute custom club fitting, utilizing our proprietary club fitting system. 2.5 hour custom club fitting, utilizing our proprietary club fitting system. Other Lessons and Packages Available! Contact our Customer Service team at 877-446-5383 for more information. Shhh...this is a surprise, don't notify the Recipient! If this gift is for a current GOLFTEC student, we will convert Gift purchases into lessons on their account. 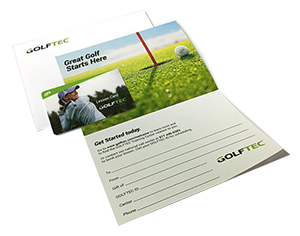 Please select the GOLFTEC Training Center that you think your gift recipient would prefer. Your gift is valid at all GOLFTEC locations. Your gift recipient can change GOLFTEC Center later if they desire. Make your best guess and we'll take care of the rest. (Delivered within 5-7 business days. (Delivered within 3-5 business days. Clicking "Next" will not charge your credit card. You will have the chance to review your order and submit payment on the next page. Yes, send me email updates about specials from GOLFTEC. Clicking "Place Order" will charge your credit card. Please correct all fields bordered in red to continue.